Not to be confused with Slingshot. A sling is a projectile weapon typically used to throw a blunt projectile such as a stone, clay, or lead "sling-bullet". It is also known as the shepherd's sling. Someone who specialises in using slings is called a slinger. Whereas sling-bullets are common finds in the archaeological record, slings themselves are rare. This is both because a sling's materials are biodegradable and because slings were lower-status weapons, rarely preserved in a wealthy person’s grave. The oldest-known surviving slings—radiocarbon dated to c. 2500 BC—were recovered from South American archaeological sites located on the coast of Peru. The oldest-known surviving North American sling—radiocarbon dated to c. 1200 BC—was recovered from Lovelock Cave, Nevada. Ancient Greek lead sling bullets with a winged thunderbolt molded on one side and the inscription "ΔΕΞΑΙ" (Dexai) meaning "take that" or "catch" on the other side, 4th century BC, from Athens, British Museum. Various ancient peoples enjoyed a reputation for skill with the sling. Thucydides mentions the Acarnanians and Livy refers to the inhabitants of three Greek cities on the northern coast of the Peloponnesus as expert slingers. Livy also mentions the most famous of ancient skillful slingers: the people of the Balearic Islands. Of these people Strabo writes: "And their training in the use of slings used to be such, from childhood up, that they would not so much as give bread to their children unless they first hit it with the sling." Now one of the Huns who was fighting before the others was making more trouble for the Romans than all the rest. And some rustic made a good shot and hit him on the right knee with a sling, and he immediately fell headlong from his horse to the ground, which thing heartened the Romans still more. The Bible provides a famous slinger account, the battle between David and Goliath from the First Book of Samuel 17:34–36, probably written in the 7th or 6th century BC, describing events having occurred around the 10th century BC. The sling, easily produced, was the weapon of choice for shepherds fending off animals. Due to this, the sling was a commonly used weapon by the Israelite militia. Goliath was a tall, well equipped and experienced warrior. In this account, the shepherd David convinces Saul to let him fight Goliath on behalf of the Israelites. Unarmoured and equipped only with a sling, 5 smooth rocks, and his staff; David defeats the champion Goliath with a well-aimed shot to the head. 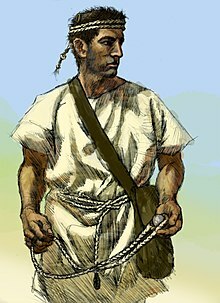 Ancient peoples used the sling in combat—armies included both specialist slingers and regular soldiers equipped with slings. As a weapon, the sling had several advantages; a sling bullet lobbed in a high trajectory can achieve ranges in excess of 400 metres (1,300 ft). Modern authorities vary widely in their estimates of the effective range of ancient weapons. A bow and arrow could also have been used to produce a long range arcing trajectory, but ancient writers repeatedly stress the sling's advantage of range. The sling was light to carry and cheap to produce; ammunition in the form of stones was readily available and often to be found near the site of battle. The ranges the sling could achieve with molded lead sling-bullets was surpassed only by the strong composite bow. At the end of one cord (called the retention cord) a finger-loop is formed. At the end of the other cord (the release cord), it is a common practice to form a knot or a tab. The release cord will be held between finger and thumb to be released at just the right moment, and may have a complex braid to add bulk to the end. This makes the knot easier to hold, and the extra weight allows the loose end of a discharged sling to be recovered with a flick of the wrist. In some cases, the lead would be cast in a simple open mould made by pushing a finger or thumb into sand and pouring molten metal into the hole. However, sling-bullets were more frequently cast in two part moulds. Such sling-bullets come in a number of shapes including an ellipsoidal form closely resembling an acorn; this could be the origin of the Latin word for a leaden sling-bullet: glandes plumbeae (literally leaden acorns) or simply glandes (meaning acorns, singular glans). Almond shaped leaden sling-bullets were typically about 35 millimetres (1.4 in) long and about 20 millimetres (0.79 in) wide, massing approximately 28 grams (0.99 oz). Very often, symbols or writings were moulded into lead sling-bullets. Many examples have been found including a collection of about 80 sling-bullets from the siege of Perusia in Etruria from 41 BC, to be found in the museum of modern Perugia. Examples of symbols include a stylised lightning bolt, a snake, and a scorpion – reminders of how a sling might strike without warning. Writing might include the name of the owning military unit or commander or might be more imaginative: "Take this", "Ouch", and even "For Pompey's backside" added insult to injury, whereas dexai ("take this" or "catch!") is merely sarcastic. The sling was also used in the Americas for hunting and warfare. One notable use was in Incan resistance against the conquistadors. These slings were apparently very powerful; in 1491: New Revelations of the Americas Before Columbus, historian Charles C. Mann quoted a conquistador as saying that an Incan sling "could break a sword in two pieces" and "kill a horse". Some slings spanned as much as 2.2 metres (86 in) long and weighed an impressive 410 grams (14.4 oz). The staff sling has a similar or superior range to the shepherd's sling, and can be as accurate in practiced hands. It is generally suited for heavier missiles and siege situations as staff slings can achieve very steep trajectories for slinging over obstacles such as castle walls. The staff itself can become a close combat weapon in a melee. The staff sling is able to throw heavy projectiles a much greater distance and at a higher arc than a hand sling. Staff slings were in use well into the age of gunpowder as grenade launchers, and were used in ship-to-ship combat to throw incendiaries. Traditional slinging is still practiced as it always has been in the Balearic Islands, and competitions and leagues are common. In the rest of the world, the sling is primarily a hobby weapon, and a growing number of people make and practice with them. In recent years 'slingfests' have been held in Wyoming, USA, in September 2007 and in Staffordshire, England, in June 2008. According to the Guinness Book of World Records, the current record for the greatest distance achieved in hurling an object from a sling is 437.10 m (1,434 ft 1 in), using a 129.5 cm (51.0 in) long sling and a 52 g (1.8 oz) ovoid stone, set by Larry Bray in Loa, Utah, USA on 21 August 1981. The sling is of interest to athletes who desire to break distance records; the best modern material is UHMWPE (trade name Spectra/Dyneema). ^ Savage, Cliff (2011). The Sling for Sport & Survival. Boulder, Colorado: Paladin Press. pp. 60–61. ISBN 978-1-58160-565-5. ^ Robert & Gigi York, Slings & Slingstones..., Kent State U. Press, 2011, pp. 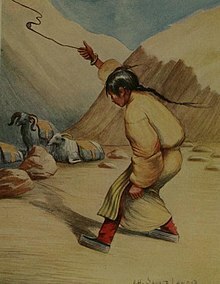 76, 96, 122; Makiko Tada, English Translation for Braids of the Andes, Second Edition. 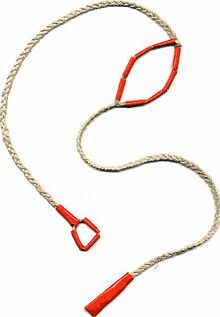 ^ Image of sling from the Tomb of Tutankhamen Archived 2006-04-03 at the Wayback Machine. ^ William Smith, LLD. William Wayte. G. E. Marindin (1890). "Image "Soldier with sling. (From the Column of Trajan)"". A Dictionary of Greek and Roman Antiquities. London: John Murray. ^ "Upper Paleolithic and Neolithic". ^ a b "Lead sling bullet; almond shape; a winged thunderbolt on one side and on the other, in high relief, the inscription DEXAI "Catch!"". Retrieved 30 April 2012. ^ "The Iliad of Homer, translated by Cowper". Gutenberg.org. 2005-08-05. Retrieved 2010-09-12. ^ "Xenophon, Anabasis, chapter III". Gutenberg.org. 1998-01-01. Retrieved 2010-09-12. ^ Lucretius, On the Nature of Things-- "Just as thou seest how motion will o'erheat / And set ablaze all objects, - verily / A leaden ball, hurtling through length of space, / Even melts." ^ Virgil, The Aeneid, Book 9, Stanza LXXV – "His lance laid by, thrice whirling round his head / The whistling thong, Mezentius took his aim. / Clean through his temples hissed the molten lead, / And prostrate in the dust, the gallant youth lay dead." ^ Pritchett, W. Kendrick (1992). The Greek State at War: Part V. University of California Press. pp. 24–25, footnote 44. ISBN 978-0-520-07374-6. ^ "LacusCurtius • Strabo's Geography — Book III Chapter 5". Penelope.uchicago.edu. Retrieved 2010-09-12. ^ "Digital | Attic – Warfare: De Re Militari Book I: The Selection and Training of New Levies". Pvv.ntnu.no. Archived from the original on 2012-07-16. Retrieved 2010-09-12. ^ Knoppers, Gary, "Is There a Future for the Deuteronomistic History? ", In Thomas Romer, The Future of the Deuteronomistic History, Leuven University Press, 2000 ISBN 978-90-429-0858-1, p. 119. ^ Harrison, Chris (Spring 2006). 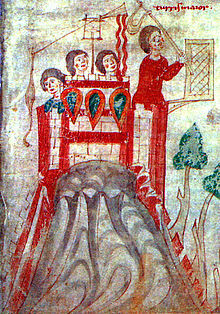 "The Sling in Medieval Europe". The Bulletin of Primitive Technology. 31. ^ Cunliffe, Barry (2005). Iron Age Communities in Britain: An Account of England, Scotland and Wales from the Seventh Century BC until the Roman Conquest (4th ed.). Routledge. p. 136. ISBN 978-0-415-56292-8. ^ Cahlander, Adele (1980). Sling Braiding of the Andes (Weaver's Journal Monograph IV). St. Paul, MN: Dos Tejadores. ISBN 978-0937452035. ^ Caesar Bell. Gall. 5,43,1. ^ "Bullets, ballistas, and Burnswark – A Roman assault on a hillfort in Scotland". Current Archeology. 1 June 2016. ^ Bradbury 1992, p. 89. ^ Bradbury 1992, p. 262. ^ Paul Campbell. "The Chumash Sling". ABOtech.com. Archived from the original on 8 June 2007. Retrieved 16 May 2007. ^ "Slings from Peru and Bolivia". Flight-toys.com. 2010-02-18. Retrieved 2010-09-12. ^ Jane Penrose. Slings in the Iron Age. Retrieved 30 June 2010. ^ "Ethnic Clashes in Kenya". New York Times. 2008-02-03. ^ Jeffrey Gettleman (2008-02-01). "Second Lawmaker Is Killed as Kenya's Riots Intensify". New York Times. Bradbury, Jim (1992). 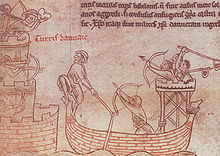 The Medieval Siege. Woodbridge, Suffolk: Boydell Press. ISBN 978-0851153575. Burgess, E. Martin (June 1958). "An Ancient Egyptian Sling Reconstructed". Journal of the Arms and Armour Society. 2 (10): 226–30. Wikisource has the text of the 1911 Encyclopædia Britannica article Sling. Wikimedia Commons has media related to Sling weapons. Slinging.org resources for slinging enthusiasts. Sports and Pastimes of the People of England, Joseph Strutt, 1903. Funda, William Smith, A Dictionary of Greek and Roman Antiquities.